Last week we saw that magnesium supplements can be very effective for cramps, especially night cramps and for restless legs. Magnesium is required by over 300 enzymes including those needed for muscle contraction, energy metabolism and others such as protein synthesis. One of the reasons Magnesium is not more frequently used in medicine is that it has a very low commercial value and is unattractive for pharmaceutical company drug trials. As a naturally occurring mineral it would be difficult to patent as a drug. 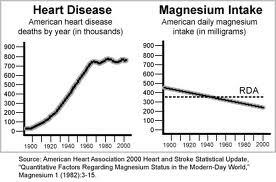 Diagram Comment: While the diagram does indicate a relationship between Magnesium and Heart disease, it is important that we see heart disease as caused by many factors including diet, lifestyle and genetics. In saying that, low Magnesium is a contributor to cardiovascular problems. As a nutritional medicine practitioner it is one of my most commonly prescribed supplements. While I use it most commonly for cramp it has real value for cardiovascular function. Because it helps regulate electrical impulses it is excellent to support normal heart rhythm especially for those with AF. I have seen those with mild arrhythmia return to completely normal using targeted magnesium plus appropriate dietary changes. It can also be very helpful when part of a nutrition programme for hypertension. Magnesium helps dilate blood vessels thus reducing blood pressure. While magnesium is important in hypertension other natural compounds especially antioxidants and Co enzyme Q10 are just as important. The goal with hypertension is to relax smooth muscle that lines blood vessels. This helps to dilate blood vessels to improve blood flow and reduce blood pressure. We also want to help improve the structure of the proteins, especially collagen and elastin, which comprise much of blood vessels. It is here where antioxidants such as grape seed extract, bioflavonoids and vitamin C are effective at helping collagen formation and repair. Beetroot juice is a proven way to lower blood pressure. Foods high in nitrates dilate blood pressure and are great for general circulation. For hypertension I like to combine supplemental magnesium, beetroot juice and my Cell-X antioxidant/mineral/vitamin complex. This combined with sodium control and exercise can produce real benefits.